It's the FINAL FøUR of Wiener Madness! Welcome to Thank Dog It's Friday (TDIF! ), where we dig up our goofiest, most ridiculous stories, just for you. If things don’t get weird, we’re doing something wrong. 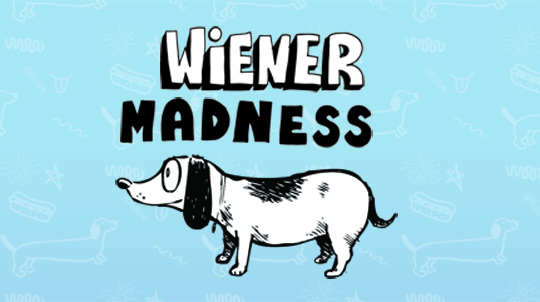 This week: Round 2 of WIENER MADNESS!!!! 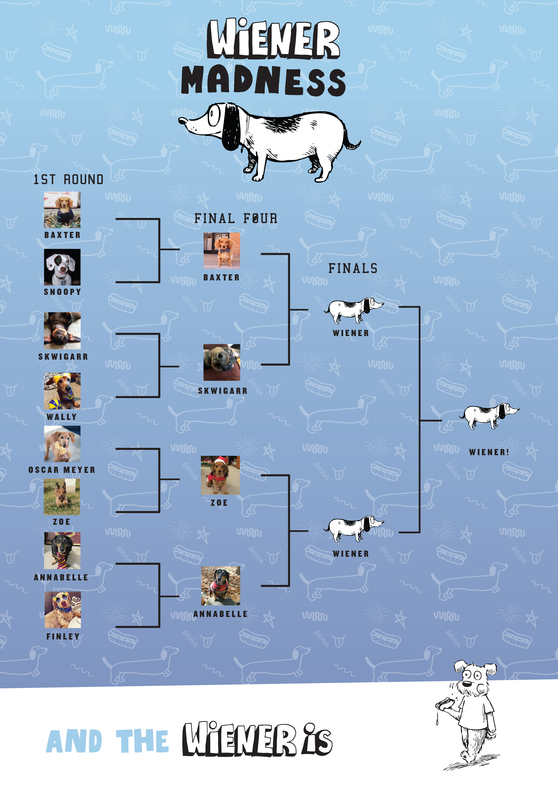 Welcome back to Round 2 of WIENER MADNESS, and the chompetition is as tough as ever! You sent us your best Weenies, we (agonizingly) picked nine faves, and after you sent us your votes, we're back with THE FINAL FøUR. To be honest, we can't stand how friggin' good these Wieners are. THANK YOU for voting, because if it was up to just us to pick, the Selection Committee would be stuck at the office like a Weenie stuck in a jacket sleeve. Here's where the chompetition stands! Don't forget to VOTE at bottom! Snoopy almost had the chompetition licked, but Baxter led the league in style points scored. Finley thought this would be a Snap, but Annabelle put a spell on us. In the battle of Seniors vs Puppehs, the grayhairs took the pups to school. Oscar Meyer's as dapper as they come, but Zoe's vertical ear-jump helped her pull in the win. Wally had the Golden Touch, and Ethel was a popular pick to stroller her way to the win– but Skwigarr's ear-span turned enough frowns upside down. How you doin, everybody? I can't lie, some of us at Bark headquarters were a little misty-eyed at the results. We're excited for the winners, but man oh man, we hate to see any of these wonderful Weens go home. Let's give one more round of applause to Snoopy, Finley, Oscar Meyer, Wally and Ethel! Baxter's warming our hearts with that fetching sweater– but Skwigarr bets that, after a (MUCH) closer look, he'll be your pick. Can Annabelle hike her way to the top? Or will Zoe show us the spirit of giving… her your vote? Go furth and vote wisely for the fate of these Wieners lie in your hands. When we come back next week, we'll know which two weenies go into the Chompionship for the grand Wiener showdown! VOTE NOW! MAY THE BEST WEENIE WIN! Share your Wiener love with the world! You might not have a Wiener, but you can still vote! Send us your dog pictures and videos and tell us why your pup is a champion. We'd love to see them.